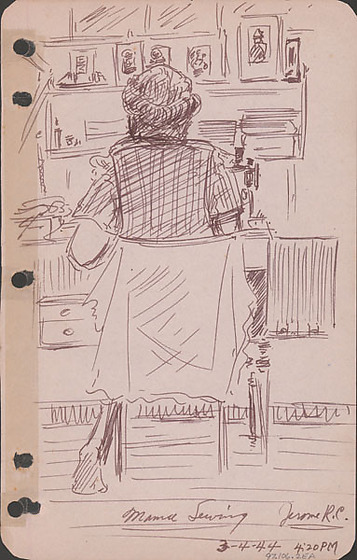 Ink drawing of a woman, Mama, sewing at Jerome Relocation Center, Denson, Arkansas on March 4, 1944, 4:20 PM. Seated on a cloth covered chair with her back to the viewer, Mama is dressed in a dark top and her hair is pulled back in a roll around her head. Her left foot is visible. The sewing machine sits on a table with drawers and is partially visible on the right. Six framed pictures and stacked books or papers are located on shelves in background. Lines indicate wooden floor. Written in black ink, bottom: Mama Sewing Jerome R.C. [underlined] / 3-4-44 4:20 PM.